WOULD A SERVICE DOG IMPROVE YOUR LIFE? We’re honored that you’ve chosen Dogs For Our Brave (DFOB) to potentially provide your future friend, partner, helper and dog. Our mission is to provide service/companion dogs at no cost to service members who have suffered catastrophic injuries such as loss of limbs while in service to our country. In order to do so without adding a financial burden, our goal is to provide professionally trained service dogs, dog food and veterinary care wherever possible. We are not affiliated with ADI (although we do following ADI’s guidelines pertaining to training and access), and we are a 501(c)3. We’re looking forward to assisting you throughout your service dog journey, both now, in the beginning and later, when you’ve received your partner. As a service member, your ability to successfully function in daily life is of utmost importance to us. There are two ways to apply for our program. CLICK HERE TO DOWNLOAD THE FORM to tell us about yourself, and follow the instructions on the form for submission by mail. Or, use the online submission form below. You will need to complete this form in its entirety, answering all questions for the person wishing to partner with a service dog. Once you hit SUBMIT, your application will be electronically submitted to our Intake Coordinator for review. Once your application is submitted either by mail or electronically, DFOB will review it in its entirety. We may contact you for more information, clarification, or to request additional documentation or supporting materials. We reserve the right to require documentation, supporting materials and references beyond what is requested in this Submission Form. Photos of all assistive devices used day to day (wheelchair, braces, stick crutches, pulley systems, etc.). You will need to provide pictures of all medical equipment. You will need to provide pictures of house and yard and a detailed layout. You will need to provide vet records for all animals currently living in the home. A letter of support from at least one specialist on your treatment team. This letter will vary for each client. This letter must detail specific aspects of your disability and how your specialist believes a service dog would be of benefit to you. This letter is required before your application can be considered “complete.” The more letters of support an application includes, the better. An additional letter of support. This letter may come from your spouse, a friend or your therapist. This letter must include contact information for the person who wrote it, including a phone number, address and email address, detail your relationship to them, explain why they believe a service dog would be beneficial and express their support. This letter is required. A picture of you and your family, including household pets. Multiple pictures are acceptable. Your application will not be reviewed until these letters are received, so please mail them as soon as possible. If you're applying for someone under your guardianship, please complete the following information for both yourself and your partner, if applicable. Please provide the following information about all pets (including birds, small animals, horses and outdoor/working animals) living in/around the home. If you have a group of animals that live together, such as cattle, fish, chickens or a flock of outdoor birds, you do not have to list each individually; simply note the type of animal and how many. All dogs, cats, small animals and other indoor pets must be listed individually, regardless of species. Do you have any regular visitors to the home? If so, who and what are their ages? Is anyone living in your home afraid of dogs? Is anyone living in your home allergic to dogs? 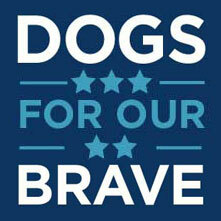 How did you hear about Dogs For Our Brave? Have you partnered with a service dog in the past? If so, when and what was/is their name, breed and ID number? What is your primary disability? What caused your disability and at what age? What is your approximate weight and height? If you answered "yes" to Seizures, please provide more detail. What kind of seizures? How long do they typically last? Do you know a seizure is coming? If so, how? Are you on medications for your seizures? What medications? Are your seizures life-threatening? Is it ever necessary to call EMS or 911 because of your disability? If so, how often? Who goes with you? How often are you hospitalized or taken to the ER? Do you use any of the following in your day-to-day life? What other adaptive equipment do you use? What medications are you currently on and why? What medical treatments do you currently use? Which branch served in as a member of the Armed Forces? Do you still serve? What is your primary reason for seeking out a DFOB service dog? What are three things you would change about your day-to-day life as it relates to your disability? What are your three biggest fears day-to-day now, without a service dog? List 10 words that you feel describe you. Five of the words must be attributes you feel are positive and five must be attributes you feel are negative. How long have you seen this person? Will you be obtaining a letter of support from this person? Have you ever owned a dog? If so, how many dogs have you owned? When did you own each dog? What kind of dog? How long did you own the dog? Why do you no longer own the dog? Did you take care of the dogs listed above? If so, which ones? How well trained were the dogs that you owned? Who trained them? Did your dog(s) stay outside or inside? How were your dog(s) disciplined? What are your three favorite breeds of dogs and why? Do you have a gender preference? If so, why? Do you like long or short hair? Why? Do you like small, medium or large dogs? Why? Who is your favorite "movie" dog? What would be your "dream dog"? List the tasks you'd like to see your dog perform. Please detail anything else you'd like us to know about your past dog ownership and your desires, dreams, goals and wishes as it relates to your future partner. What type of home do you currently reside in? What is the closest metropolitan city to your home? How many miles is your home from that city? Describe your home life. Is it quiet? Chaotic? Bustling? Calm? Noisy? Please be as detailed as possible. Describe your neighborhood and its location. Is it rural? Close to a major road? Lots of children? How would you describe the layout/feel of your home to someone else? Check all that apply. Tell us about regularly scheduled activities, appointments and happenings. Are there any other regular events/activities that occur on a less frequent basis, such as monthly or annually? If so, what? Is there anything else about your home life we should know about? What do you do? Please be as detailed as possible. How would you describe your workplace environment? Have you spoken with your employer about your decision to obtain a service dog? Describe the area you work in. Do you have an office? A desk? Are you on your feet all day? How many coworkers do you have? Is there room for a crate or a dog bed in your personal workplace? Are you ever in a laboratory or sterile environment? If so, when? What is the longest meeting you regularly attend? How do you see a dog fitting into your work life? If so, where? Please include the address, county and phone number for the school. How many hours a week are you in school? What is your grade level, or how many more months or years to complete your degree? Do you participate in special programs, classes or activities throughout the school day? How would you describe your school environment? Have you spoken with your administrators about your decision to obtain a service dog? Describe the area your study/attend class in. Do you have a desk? Do you change classes/locations? How many students are typically in a class with you? Is there room for a crate or dog bed in your classroom? Do you participate in sports, clubs or after-school activities? If so, what? How do you see a dog fitting in at school? What else should we know about your school life? What are some of the ways in which your family spends free time together? Do you or anyone else in the family play sports? If so, which ones? What places do you frequently visit? For example, do you and your family enjoy going to the movies? Eating out? Attending church? Going to the shopping mall? Are there any "special" activities in which the family or you commonly participate? Examples include martial art competitions, the rodeo, concerts or summer camp. Outside of traveling, what other places do your frequently visit? What other activities in which you frequently participate? Do you exercise regularly? If so, what kind of exercise? Where do you exercise? Do you own your own vehicle? If so, what is the make, model and year? What other types of vehicles are in the family? Do you (or does your child) ever take public transportation? If so, how often? Do you ever travel by air? If so, how frequently? Boat? RV? Four-wheeler? Bike? Motorcycle? Do you take vacations? If so, how often? To where? Do you regularly travel for work, school or personal reasons? How often? Where do you travel? How do you typically travel? What else should we know about your regular transportation and travel? Graduating High School? Graduating College? What are your work goals? What do you see yourself doing in the next two (2) years? What do you see yourself doing in the next five (5) years? What else should we know about the way your school, home or work environment may change? PITA is the orientation, training session and process by which you will be trained to work, communicate with and function with your new partner. You will learn to function with your service dog as a team in public, at home, at work and at school, as well as all other venues in which you regularly participate. On the final day of your PITA session, you and your new partner and the Dogs For Our Brave staff member will travel to the closest mall in order to complete your Public Access Test. This is the actual certifying standard used by DFOB to determine if a team is truly ready to function in the field as a fully certified service dog team. This test must be passed before your dog can be certified and granted public access. Your test will be filmed in its entirety for legal and logistical reasons. You will be provided with two complementary DVDs of your Public Access Test. Upon passing the test, you will be presented with two ID cards, a certificate and a life-long, forever friend. The newly formed service dog team must re-certify annually for the first three (3) years it's functioning in the field. Recertification will be available in designated cities determined by DFOB. If you are unable to travel, alternate plans will need to be considered. I will travel to Dogs For Our Brave's designated location. Congratulations! You've finished the hard, grueling, time consuming part of our application. Just a few more easy questions and you'll be pressing SUBMIT and sending your application to us! If you receive a Dogs For Our Brave Service Dog, you need to understand that all of the following terms will apply. Please check your compliance beside each term.